An Expanded Missouri Bend Studio Shop! Greetings on a blizzard-filled day here on the Plains! We've had quite a bit of snow throughout the day, but neither of us had to leave the house (not that we could anyway) as the university had cancelled classes, so we had a lovely day inside...mostly. I managed to finish the task of closing The Art Filled Home, our collaborative Etsy shop, but not before transferring all the listings to Missouri Bend Studio. All the works that lived their short life (in near oblivion!) in The Art Filled Home will hopefully now find viewers and a loving home. You can find all those mixed-media one-of-a-kind print based pieces in the Collaborations section of MissouriBendStudio. As readers of this blog might remember from earlier posts, the daily print series we worked on together this fall are there, but also the older pieces some of which are shown in this post. The piece above was part of a series done in 2014 for a joint exhibition we had at the University of South Dakota. A Gathering of Stones, above, and the one below are from last spring when we began the shop. It was a continuation of that earlier series in terms of format, but with a different color palette and imagery. Johntimothy created layers of lovely silkscreen patterns, which I responded to with drawing and painting. Now that he's back teaching classes full time, we have to figure out a new collaborative series, so stay tuned! So, winter storm Jaxon was slow to materialize, but I guess he was everything they predicted....I'm not sure how much snow this is, but Johntimothy probably does, as he spent a few hours this afternoon, along with the neighbor, shoveling us out. The snow was beautiful coming down, but the winds created white-out conditions, so hope folks stayed off the roads! 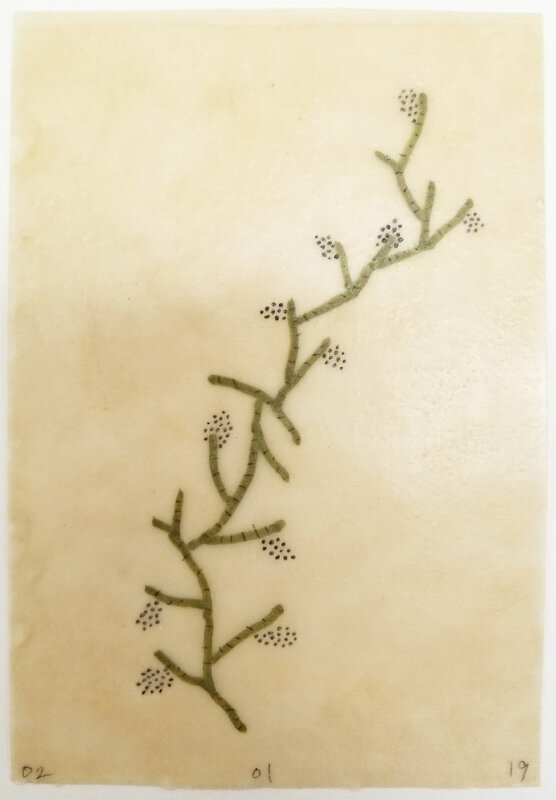 Meanwhile, I've been experimenting with new possibilities for the daily drawings, but due to supply constraints, I've returned to using the Japanese rice paper/beeswax....I have a good amount of the paper and the beeswax is pretty irresistible. I'll save the good (BFK Rives) for larger drawings....it's expensive and I would pretty much decimate Johntimothy's supply if I used it for the daily drawings. Here are a couple of the latest dailies. I've begun another series of drawings that explore the possibilities of white on white, which I'll share with you in the next post. They are mixed media with painting, ink, pencil, collage and embroidery. One is finished and the next one nearly so. I'll be back by the end of the week to share those with you. Hope your week has started off well....see you soon...cheers! A new daily series is born! Late last week Johntimothy laid a couple prints on my desk from an engraving plate he was working on. He thought it might be fun for me to play with them....a little watercolor or drawing on top, just to see what happened with them. Eventually, at the beginning of the week, I took some time with one of them....and the next day, another. Then it occurred to us that these were collaborative monoprints and they might be another fun daily project for us to share for sale in The Art Filled Home. That engraving plate had had some revisions throughout last week, but he went ahead and printed five more and each day this week I've been engaging with them in a new way. We have the first six days of this week here to show you and are in the process of listing them in the shop. A lot can change, depending on the colors I choose and the drawing marks I make. I love the raised surface of the printed engraved line....so crisp and clean. We are still working out the details of how this daily project will proceed as we move forward into next week. He has a number of these tiny 4"h x 2"w plates currently underway. We've decided there are no hard and fast rules, except that it's one plate per week. The plate may be finished already and be printed 7 times or he may be working on it throughout the week and the plate will change daily as well. If you look closely, you can see that the engraved print underneath will have changed from one print to another. Also, because there was no particular orientation to the original print, I may have flipped it from one day to the next and felt it read better in a different way depending on what I'd done with it. Yesterday (above), I got a little heavy handed, since I started out with gouache instead of watercolor. Much of the lower portion of Johntimothy's beautiful engraving print is obscured, but I can still see it and I think the sense of layering makes it interesting. Still, I think I've learned to stay away from the gouache for this process! That may explain why I pulled way back and kept the drawing pretty simple today....just playing with my favorite mark, the humble dot, to carry the flow of the engraving marks. There's something to be said for the beautiful contrast of simple black and white, that's for sure! Of course, I don't need to tell that to a printmaker. We're happy with this project and look forward to sharing the results here on our blog and in our shop. I like the fact that the prints from any particular week can make a nice grouping, as they share that underlining engraving drawing. The first couple mono prints are listed in TheArtFilledHome and the others will soon follow, so please check back often! Hope you enjoy your weekend! Greetings, with an update from Missouri Bend Studio, where Johntimothy and I are busy in the studio. As I've given some thought to this blog, I think we'll focus a Tuesday post on what Johntimothy is up to, both in and out of the studio and a Friday post will feature my work...Studio J and Studio P, so to speak. So, today is Johntimothy's day....I'll follow him around a bit! Working on one of many mixed intaglio plates he has in the works! Johntimothy and I have been attempting to maintain a somewhat strict studio schedule of late, trying to keep ourselves productive and on course. He is on sabbatical this semester and therefore doesn't have any classes to teach, so is dedicated to spending time making new work and finishing some other projects. We both spend mornings in the studio and he too has begun working on his own daily drawing project....but, more on that another time. This morning he worked on a number of plates he has had in process. All are intaglio plates, which means that he is creating the image by incising into the plate with various tools. Intaglio is a broad term, which might include any number of processes such as etching, engraving, drypoint, or mezzotint, to name a few....and in fact, to name all the processes that have some part to play in each of the plates he is currently working on! He refers to them as "mixed intaglio". Some of the tools that come into use can be seen below on his desk. That's quite a magnifier, eh? I think my work is hard on the eyes, but try drawing fine lines and tiny marks through a zinc plate and being able to see what in the world you've done! Over lunch I asked Johntimothy to define the printmaker's lingo in layman's terms, so I could help relay it to our readers. I'll give you the basics here, but you can click on each of the terms and be taken to more expansive Wikipedia definitions and discussion. He loves all these processes and depending on what he wants the image to reveal and what kind of mark he wants to make, he will choose the method and proper tool for working the plate. Drypoint: drawing directly into the matrix or printing plate (could be metal or even plexiglas) with a sharp stylus. Etching: image in the plate is the result of etching with acid or corrosive salt (he uses ferric chrloride, a safer etchant) in order to hold ink. Engraving: Cutting incised lines in a metal printing plate with the use of a burin (there's also wood engraving, but that uses different tools). Mezzotint: Reductive process in which the drawing is revealed by scraping and burnishing the image of the dark background surface created by a making a field of dense burrs with a tool called a rocker. Mezzotint creates a tonal image. Those are very basic ways to describe the different processes, so I encourage you to follow up and investigate these links to find more information. You will see the evidence of all of these processes in his work....check out his gallery page here on the website. So, after working on a plate for some time, it will be time to see just where it is and how far it's come from the last proof. So today, some fresh proofs ended up pinned to the board in the studio. Check them out....everything still a work in process. He'll often pin an earlier version below and the fresh proof above in order to check progress, as seen here. The changes in the print immediately above here are the most striking. See especially the difference in the rich darks that show up in the upper example. That's the mezzotint....so he "rocked" that part of the plate to create the tiny burrs that hold a lot of ink, creating that rich, deep black. Where you see white on the plate, the ink is wiped off, leaving ink only in the incised lines that show the image. This image will go through quite a bit more change, I'm quite sure. I'm glad he was ready to do some proofing today, as there are many many hours of work on the plates in between printing even just a proof. I have immense appreciation and respect for printmakers and ability to create such richness from a simple piece of metal. There is a long history, tradition and dedication to craft that comes with the territory, which draws many folks to become printmakers....and others of us to love what they are able to create! I’d like to talk a little bit here about the daily drawing ritual that keeps me grounded and balanced. I call the practice Drawing Meditation, as it shares some similarities with a more traditional sitting meditation that focuses on the breath. Meditation can take many forms, but often one sits quietly and focuses on the breath, working to detach from the thoughts and distractions that inevitably flood the mind. The idea, as I’ve always understood it, is to let go and not get caught up in the “monkey mind” that keeps us all on edge and off balance. I do this same thing through drawing. I sit down each morning with a sheet of 6” x 4” blank Japanese paper and a pencil and often a bit of watercolor. With no attempt to make a particular drawing, that is, with no idea what will emerge, the drawing begins. The process is one of letting go, as I let my hand make the marks on the page. There is a kind of remove, as I become the observer, detached….there and not there, fully present but not exerting control….letting go. In this practice, watching your hand move across the page is akin to focusing on the breath. If you are in a mindful state and not exerting control, there will be a kind of detached wonder at what emerges on the page. Remember, that inner critic has been banned from entering the room, so you are free! Think of it as a kind of dance. You will know from within when you are finished. Since there are no rules, there is no need to fill the page…there may be just a few stray marks, but you will be in tune with your own sense of balance and composition, the weight of line, the sense of space etc. What emerges on the page may not be anything you recognize in the outer world around you. At the end, the drawing you've made may or may not be to your liking...but, the product isn’t the point. I believe that you will have begun to tap into your inner landscape….that place that is your source, where your knowledge and wisdom reside. My drawing meditation practice may last just five or ten minutes, but there are no rules, so it might take you longer. But the idea is not to labor over it....if you find you are putting effort into thinking about it or about what to do next, you may not be in the flow of it. Like anything, it may take practice, so If you are new to this, it may take some time to be able to relinquish control. You are not making a “drawing”, but the drawing is reflecting you, in a sense. Over the course of time, with such a daily practice, you will begin to see and have a sense of your own mark making and I also believe you will develop a new kind of trust and connection with yourself. Strangely, in the process of letting go, you may feel more in touch. I’ve carried on with this daily practice on and off for many years now. There are periods when I drop it or the dedication falls by the wayside, not necessarily intentionally, but because life gets a bit crazy. But I am also reminded how important and fundamental it is for me when I return to it. My sense of equilibrium and balance is restored. I've shared here a week of daily drawings....each one different, each one a reflection of a the few introspective moments when time slows down and the inner landscape reveals itself. The invisible made visible. I have many of these daily drawings, the result of this meditation practice, available at a reasonable cost in my Etsy shop, Missouri Bend Studio. Countless dozens are available in the shop and hundreds more lay about in stacks in the studio. That may seem contradictory to everything I’ve just said about the process not having to result in a product. Let’s talk about that next time….I have some thoughts to share! In the meantime, before I post today's daily drawing, just a note to let you know I am planning a newsletter that will go out the first of each month (or thereabouts!). In addition to news and updates, newsletter subscribers will receive a discount on purchases in the shop here at Missouri Bend Studio. I'd love it if you subscribed! You can do that by filling out your name and email address on the form located on the About Us page here on the website. Don't worry, your contact information stays here. I'm still working out the ideas and format for the newsletter, so please let me know if there are things you'd like to see or hear more about. Look forward to hearing from you....enjoy your weekend! I seem to be carving out a bit more time in the studio....enough to get back to the dailies and finish up a couple more ambitious pieces. This summer is filled with visitors and trips, both near and far, so this open window of time is not going to last long....but for now, I'm enjoying the rhythm. Another finished piece in the Explorers' Notebooks series. The slow pace involved in making these pieces gives me time to ponder....what they reveal and what they conceal. I wonder if those words, caught in the net, are a metaphor for unspoken thoughts or unrealized dreams. Are they words undelivered or perhaps caught, just in time, allowing them to be sorted and spoken with more care? And that river....it's the one I look at every day out my window, but it is so much more than that, of course. I think of it as the river of time, of memory....the one that sweeps all our days away to join the others downstream, the one that reminds us that change is constant and each day we have the chance to begin anew. Johntimothy and I are also in the process of collaborating on mixed media print works, which we sell in our Etsy shop, The Art Filled Home. You can view many of these works here on our website, as well. I have a stack of beautiful patterned silkscreen pieces that he has made, ready for me to draw on, but I seem to have gotten away from them of late. This week, I finished one up that I like very much. I find I am drawn to a slightly off-kilter composition, just out of balance, yet one that invites relaxation and contemplation. Stones, such as these, often find their way into my work, as yet another signifier of time and memory. And those flowing lines....in some ways, they are much like a river. This piece is just as much Johntimothy's as it is mine....he sets up the color palette and the subtle patterns and I respond with drawing. We have much to explore in this area, with plans to create more scroll-like compositions, playing more with juxtaposing pattern and image. Stay tuned! Meanwhile, earlier this summer we (meaning, mostly Johntimothy) put the finishing touches on the fire pit area, the project we began last summer. It's so wonderful to be out by the water on a not-too-hot summer afternoon with a cool, refreshing drink. It feels as if we have a whole new living room, actually! There have been quite a few fires in that fire pit, but evenings lately have been a bit muggy. But, Johntimothy has wood, branches and kindling placed just so in there....we're ready on the next night that's just a bit cooler. Actually, I believe I'll head out there now! Until next time....enjoy your week! I love the long, slow days of summer when the sunlit evenings linger, moving in a kind of slow motion, toward the approaching hour of sunset. While we have breakfast, and often lunch, on the front porch where the nest full of newly hatched barn swallows is the star attraction, the evenings are often spent out closer to the river in our fire pit patio area. Not tonight though....with the menacing storm approaching, we returned to the front to sit through the storm under cover. A little hail, some heavy rain, and then bright skies returned and a quiet hush fell as the ground soaked up that much needed water. We've waited so long for some rain, I felt myself relax just a bit....for the sake of the parched plants. In the middle of each day, I try to spend some time in the studio. Days are often filled with weeding, gardening chores, and errands, so I'm lucky just to get to the daily drawing and a bit of journal writing. But always the goal is spend some real time working....that's when all my insights come....during the slow passage of time quietly drawing or stitching on paper. The studio is where the grounding happens and I'm easily thrown off kilter if I neglect my time there. This piece above is still in the works, but I thought I'd share it with you now as a way of talking about the intuitive process in the studio. This series, The Explorer's Notebooks, allows me to pay homage to the beautiful journal pages and documentary drawings of explorer's through the ages, while also drawing on my own inquiries in living mindfully each day. I am drawn to the magical capabilities of language, though I am not a writer. As a visual artist, I use asemic writing to spark curiosity and wonder, in myself and in the viewer. With each drawing, I "know" one step at a time what goes where, which means I never really know how a piece will come together until it is finished. I start from a place of unknowing and usually end at a place of understanding, as the slow revelations happen while the work progresses. Putting the understanding into language, which is after all the inspirational foundation of the work, is most difficult. In this piece, it wasn't until the main base layer of the piece has been drawn and then dipped in the beeswax that I knew what I was to do next....a net....to capture language. The countless words that we speak or hear during the course of a day, the important ones and those that are lost to oblivion....all those words. Not to mention the words rattling around in our head that never escape our lips....all those thoughts, all those precious words. They hold the power to heal or destroy, create anew or kindle a fire in the heart. What if you could capture all the words that filled your day in a metaphoric net....one that allowed you to sift and sort, holding on to the treasured words and taking back the ones you never meant to say? Or the ones that hurt you....perhaps you could let them go? What if there was a count of all the words spoken....how would you form a tally? And that river.....isn't it really as if all the words are like a constant stream, moving along toward a fast moving river? The hours of our day rush past, sweeping all those words up in a torrent. But the river, isn't that the flow of our collective history....who can say where it is going? I took this photo earlier in the day and now the piece is further along....I will share it here when it is finished. Our 4th of July national holiday is fast approaching. We'll have some houseguests, including two lively dogs, which will be fun! Hope you enjoy the holiday....see you soon! Here we are nearing the middle of June and suddenly the off-and-on warmth of spring has been replaced by the full-on heat of summer. Wow, some days are approaching 100, I think. And while we shouldn't be surprised, somehow each year we find ourselves taken aback. But, it is a beautiful time, and the work in the yard and garden is worth the effort. These days, that effort happens early in the day or much later in the early evening. We are especially enjoying the many irises, which continue to occupy more and more of the beds each year. So much variety and that the are so kind to bloom in stages so we can enjoy them longer! So, between finishing up a new outdoor fire pit area, tending to the garden beds (sporadically) and dealing with the rest of life (including relocation of an aging parent in the family), there is just not enough time in the studio these days. I may have twenty minutes or half and hour here or there, which is enough to make progress, so I work when I can. I do work best without the constraints of having to take care of so many things at once....wide open spaces of time. I suppose we all do, don't we?! As the current series of work involves the notion of exploration and navigation, I may just have to take up some of these notions in the next piece. In the meantime, I'm happy to finally have finished Explorers' Notebooks, no.3 this afternoon. While much of my work finds its way to the Etsy shop, I plan to create a shop here on this site for both Johntimothy and me, where works not available on Etsy can be purchased. That's a project for the next couple weeks...another bit of exploration sandwiched in between all the other things there are to do. I hope to see you next week, but we are off on a trip to deal with family business, so will touch base as soon as possible. Cheers! I've been inspired lately by a new book I checked out from the local public library, Explorers' Sketchbooks (now on its third renewal!). I am struck by the notion of exploration, which is rooted in an innate curiosity about the world. We are used to hearing about all manner of men and women (mostly men, of course) down through the ages who risked their lives to venture into the unknown. But, does it seem to you, that there is a sense that we've essentially discovered it all? While that is not remotely the case, it feels as if, in the public imagination, there is a lack of curiosity about the vast unknown worlds. Think of all those unexplored territories that surround us on all sides....the soil beneath our feet, the expanding universe, black holes, dark matter, the human body, the oceans, migration patterns, traffic patterns, it's endless....we've not even really scratched the surface! I've begun a new series of mixed media drawings, Explorers' Notebooks, that will allow me to explore the idea of "exploration." Inspired by the Explorers' Sketchbooks, filled with images and text including the beautiful journals, notations and drawings, all attempts to capture the newly seen and experienced, I am using these pieces to explore my own inner worlds, as well as the place and moment in time where I find myself. All of which can be seen as uncharted territory. While so many places on the planet have been discovered, mapped and described by others, maybe the secret and the way to reignite our curiosity is to attempt an expedition into our own worlds....the places we think we already know. Speaking of discoveries, thanks to Jennifer Coyne Qudeen for the word "asemic", which is defined as a kind of wordless open semantic form of writing. It is the form of writing without a specified content. I was astonished to come across it on one of Jennifer's Instagram posts, as my own practice is based in what I have always, clumsily called, wordless writing...or some other vague term. To discover that what I do in the studio and the mark making practice that comes so naturally to me, not only has a name, but a codified definition and a whole host of practitioners....well, it feels akin to discovering someone at last who speaks my language. The marks that fill these drawings hearken back to the pattern of writing, perhaps a newly unearthed ancient manuscript, an attempt to communicate down the ages (as the written word is meant to do), but which, for whatever reason, can no longer be deciphered. Writing and text, seen in these visual terms.....that's my current exploration. Thank to Jennifer and all the countless others who practice asemic writing....you've marked a path for me and now I'm on my own road of discovery. Cheers!